Gloria Hansley Cook, age 89, of Escanaba passed away Wednesday June 6, 2018 at her home in Escanaba. She was born on June 4, 1929 in Escanaba, the daughter of Juel and Naomi (Peterson) Lee. Gloria grew up in Escanaba and was a 1947 graduate of Escanaba High School. She continued her education at Stephens College in Columbia, MO where she graduated in 1949. Gloria also attended Michigan State University. She worked in New York at Dun and Bradstreet and later was a ground hostess for British Overseas Airways. In 1958, the former Gloria Lee married Robert W. Hansley and he preceded her in death in 1995. Together, the couple shared 37 years of marriage. She also was employed for WDBC in Escanaba where she was in charge of the Women’s Program. Gloria married Jack A. Cook and he preceded her in death on November 9, 2016. She was very active throughout the community with golf, bowling, cards, bridge, and poker. 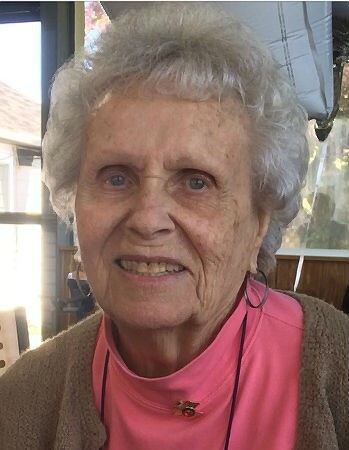 She was a member of the Red Hat Society, Bay Sages, the Women’s Circle at First Presbyterian Church, Escanaba Country Club (5-time champion), R.C. Hathaway Chapter 49, and was on the Lakeview Cemetery Historical Society Board in Escanaba. Gloria was a world traveler where she toured all of Europe, Australia, Russia, New Zealand, South America, China, many Caribbean Islands, all of Mexico, and the South Pacific. Gloria lived a full and wonderful life and never let anything set her back. Gloria Hansley Cook is survived by Jack’s children, Judy Diehl of Pensacola, FL, Sally (Dennis) Bittner of Escanaba, and James (Paula) Cook of Escanaba; nieces and nephews, Marcus (Joan) Lee of Reedsburg, WI, Judy Urrutia of Thousand Palms, CA, Barbara (Tom) Agerter of Escanaba, and Mary Miller of Iron Mountain, MI. In addition to her parents, Gloria was preceded by her first husband, Robert Hansley; second husband, Jack Cook; and two brothers, Warren Lee, and Russell Lee. Visitation will be held from 10:00 a.m. to 12:00 p.m., Saturday, June 9, 2018 at the Anderson Funeral Home in Escanaba. Funeral services celebrating the life of Gloria will follow at 12:00 p.m., Saturday, in the Anderson Funeral Home Chapel with Rev. Bo Lange officiating. Burial will take place following the funeral services in Lakeview Cemetery. A luncheon will be served after the burial in the First Presbyterian Church Fellowship Hall in Escanaba.